Abstract: Publication date: Available online 17 April 2019Source: Composites Part B: EngineeringAuthor(s): Valerio Alecci, Sara Barducci, Angelo D'Ambrisi, Mario De Stefano, Francesco Focacci, Raimondo Luciano, Rosa Penna Composite materials have been widely used to strengthen masonry structures or to repair those damaged by earthquakes. While the effect of composite materials applied on undamaged masonry walls is widely investigated, their effectiveness when used to repair damaged ones still needs further investigations.This paper deals with the shear capacity of masonry panels repaired with carbon fiber reinforced polymer composites. In particular, masonry undamaged panels were tested under diagonal load up to failure, repaired with composite materials, and tested again. The repair technique proved its effectiveness, since the shear strength of the repaired specimens was similar to that of the original ones. The shear capacity of the repaired panels was computed with the approach provided by the CNR DT200 Italian guidelines. Within this framework, the cohesion of the masonry material was neglected for the evaluation of the shear capacity of the repaired panels to take into account for the pre-existing damage. This approach provides a satisfactory agreement with the experimental results. Abstract: Publication date: Available online 16 April 2019Source: Composites Part B: EngineeringAuthor(s): Myounguk Kim, Hyunseok Ko, Sun-Min Park A flame retardation property of polymer composites is being considered important to minimize the amount of heat release and the smoke production during the combustion. 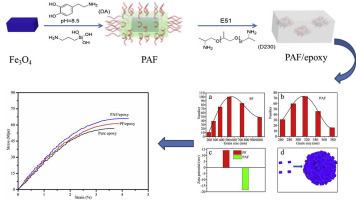 Therefore, this work aims to improve the flame retardation property of epoxy composites using ammonium polyphosphate (APP), one of the intumescent flame retardants (IFRs). However, APP could be migrated to the surface of composite due to the weak compatibility with epoxy resin. To prevent the migration, the surface modification method has taken place using various amines, acting as charring agent. 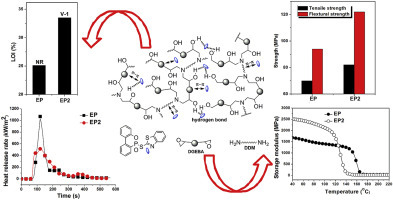 In this study, we select the 4,4′-diaminodiphenylmethane (DDM) as both curing agent and charring agent for the surface modification on the APP, and their epoxy composites were prepared. Interestingly, we observe both the fast curing effect by analyzing the curing behavior of epoxy composite by Friedman method, and significant improvements of the thermal degradation, and flame retardancy of epoxy with adding the amine-modified APP (mAPP). Moreover, the epoxy/mAPP composites showed higher flame retardation properties and formed the compact char structures due to the attached DDM, which acted as an efficient charring agent to promote to form the carbonaceous char structures. 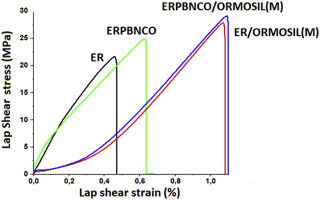 Finally, we also found the correlation between the improvements of flame retardation properties, and char structures of epoxy composites by calculating the crosslink density (Mc) using the theory of rubber elasticity. Abstract: Publication date: Available online 16 April 2019Source: Composites Part B: EngineeringAuthor(s): Qingfei Meng, Chengqing Wu, Yu Su, Jun Li, Jian Liu, Jiabao Pang In this study, the mechanical properties of a novel high performance alkali-activated geopolymer concrete under both static and dynamic loads were studied. The ground granulated blast-furnace slag powder (GGBS) and silica fume were used to manufacture this geopolymer concrete. Slabs that cast with this geopolymer concrete and steel wire mesh reinforcement were tested under close-in TNT explosion. The steel rebar reinforced C30 concrete slabs were tested as a control group. It is found that the steel wire mesh reinforced geopolymer concrete slabs achieved a more uniform strain distribution, which means a better structural performance against blast loadings as compared to the conventional C30 concrete slab under the same blast loads. The numerical investigation was then conducted to elaborate the test results. Abstract: Publication date: Available online 16 April 2019Source: Composites Part B: EngineeringAuthor(s): Shenglei Xiao, Peng Wang, Damien Soulat, Xavier Legrand, Hang Gao At the first stage of the Resin Transfer Molding (RTM) process, the composite reinforcements preforming is a complicated physical stage including complex deformability behaviours. In this paper, the deformability of carbon triaxial braided fabrics, one of the advanced composite reinforcements, is originally investigated. The yarns sliding along both longitudinal and radial yarn directions is the primary preforming behaviour, which is quite distinct from the woven fabrics preforming. Moreover, the yarns sliding along two yarn directions present quite a difference between the axial and bias yarns. The manufacturing defects during the triaxial braided fabrics preforming such as fibre vacancies, buckling and gaps are also discussed. At last, the geometrical models to predict maximum sliding along longitudinal yarn direction are described based on basic preforming parameters. Besides, the criterion preventing fibre vacancies are also proposed. Abstract: Publication date: Available online 15 April 2019Source: Composites Part B: EngineeringAuthor(s): Taijun He, Guitu Wang, Yixing Wang, Yang Liu, Wenchuan Lai, Xu Wang, Yiyu Feng, Xiangyang Liu Simultaneously enhancing of wear-resistant and mechanical properties of the thermoplastic polyurethane (TPU) is important for its wider application. 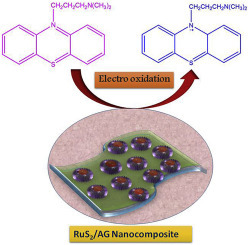 Herein, fluorinated graphene (FG) was proposed and respectively functionalized by two amine-terminated molecules: aliphatic poly (oxypropylene) diamine (D230) (compatible with soft segment (SS) of TPU), and aromatic phenylamine (PA) (compatible with hard segment (HS) of TPU). 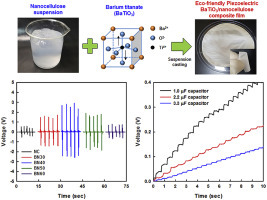 It was found that composites with two FG derivatives exhibited different levels of microphase separation, which was related to the selective interaction of the two FG derivatives with the two phases of TPU. D230 functionalized FG tends to interact with SS phase, slightly improving tensile strength and wear resistance of TPU, and greatly reducing the ductility. However, PA functionalized FG tends to interact with HS phase, which keeps the ductility of the composite, while the ultimate tensile strength is increased by 32.8% and the relative volume loss is reduced by 26.3%. Abstract: Publication date: Available online 10 April 2019Source: Composites Part B: EngineeringAuthor(s): Alessandro Bellini, Seyedmohammad Kahangi Shahreza, Claudio Mazzotti Fiber Reinforced Cementitious Matrix (FRCM) composite materials represent a recent strengthening technique, which can provide a complex scenario of different mechanical behaviors and failure mechanisms. The presented experimental study is aimed at improving the knowledge about the tensile and bond behavior of FRCMs with a focus, in particular, on the effects of cyclic loading at high stress levels. To this purpose, tensile characterization tests and single-lap shear tests were carried out on six different FRCM types, discussing and clarifying the different bond behaviors and the resulting failure modes. The experimental tests showed that the global behavior of the samples is affected not only by properties of composite grids and mortars, but in particular by the textile-matrix adhesion mechanism. The effects of cyclic loading were experimentally evaluated for each strengthening type in terms of maximum bond capacity, failure mechanism, stress-slip behavior and bond degradation through cycles. In general, application of load cycles didn't remarkably affect the performance of FRCM systems, proving their reliability under seismic forces. Abstract: Publication date: 15 July 2019Source: Composites Part B: Engineering, Volume 169Author(s): Hui Mei, Minxin Mao, Daoyang Han, Yawei Xu, Laifei Cheng Traditional ceramic foam and metal fibre media combustion were usually restricted owing to their intrinsic brittleness and easy corrosion, respectively. In order to obtain higher gas permeability, longer durability, and less noxious gas emissions for gas flame combustion, a novel SiC fibre porous medium (FPM) is investigated in this study. SiC fibre mat were firstly produced from chopped SiC fibres using solution dispersion and vacuum filtration, then a boron nitride interphase for antioxidation and subsequent SiC coating for rigidity were deposited by chemical vapor infiltration, resulted in the formation of self-supporting SiC FPM. Findings demonstrate that the microstructure, gas permeability, thermal physical and combustion properties of SiC FPM can be improved by tailoring fibre length. As the fibre length was 4.5 mm, the density of SiC FPM was 0.113 g/cm3, and it exhibited excellent properties in permeability and utilization of fuel gas, pollutant emissions and combustion temperature accompanied by slight reduction in thermal conductivity. Such ultra-light SiC FPM could respond fast during the heating process and help gas mixture burn off. Abstract: Publication date: 15 July 2019Source: Composites Part B: Engineering, Volume 169Author(s): M. López-Aenlle, A. Noriega, F. Pelayo Polyvinyl butyral (PVB) is the polymeric interlayer material most used in laminated glass elements. As other used interlayers, the PVB mechanical behavior is viscoelastic. Therefore, its mechanical characterization can be carried out by static (creep and relaxation) or dynamic tests in a dynamic mechanical analyser (DMA). However, the PVB layers constrained in laminated glass elements are subject to high temperature and pressure conditions in an autoclave during the manufacturing process, which can affect to the mechanical properties of the interlayer. In this paper, the mechanical properties of PVB constrained in laminated glass beams have been determined by static and dynamic tests on laminated glass beams with different boundary conditions and at different temperatures. The estimated curves are compared with those obtained by testing free PVB specimens in a DMA. Abstract: Publication date: 15 July 2019Source: Composites Part B: Engineering, Volume 169Author(s): Przemysław Bodzak This paper presents a parametric study on reinforced slabs strengthened by prestressed externally bonded CFRP strips with various geometric features and physical parameters. In analysed tests two different anchorages types were used: mechanical with rigid fixed the cut-ends of the strip to the concrete surface and adhesive with gradual reduction of prestressing force. Based on the conducted analysis it was concluded that the initial, prestressing force in the strip introduced before it is glued to the surface of the RC slabs has fundamental influence on the level of the element carrying capacity causing delamination of the composite from the surface of the concrete. Neither the initial nor the maximum strain of the composite is relevant if ultimate load are analysed. Also the dimensions of the strip and the strength of the concrete in the strengthened element are not as important as the prestressing force in this case. Abstract: Publication date: 1 July 2019Source: Composites Part B: Engineering, Volume 168Author(s): Marcella Grosso, Iane de Araújo Soares, Juan E.C. Lopez, Sergio D. Soares, João M.A. Rebello, Gabriela R. Pereira In this paper the detection limit of lack of adhesive defects in GFRP adhesive composite joints was evaluated through a computational simulation model of active pulsed thermography technique. In this study, several simulations were carried out in order to evaluate the influence of the thickness of the collar, heating time and excitation energy on the detection limit of defects. In addition to these analyzes, it was also evaluated the reduction of the thermal contrast of the defects as a function of the thickness of the collar (depth of the defects) and thus it was possible to estimate mathematically the limit value of the thickness of the collar that allows the detection of the defects for each heating time. The results obtained showed that the pulsed thermography technique would be able to detect defects of lack of adhesive that are located up to 8.5 mm deep in this type of composite joint. Abstract: Publication date: 1 July 2019Source: Composites Part B: Engineering, Volume 168Author(s): Xiaomeng Wang, Michal Petrů The long-term durability of the interface between FRP (fiber reinforced polymer) and concrete is crucial to the safety of FRP strengthened concrete structures. Some experimental works have been carried out to investigate the effect of environmental factors on model II fracture behavior of the FRP-to-concrete interface. However, fewer efforts have been made to estimate interfacial durability under mode I loading. This study evaluates the mode I fracture energy release rate of CFRP (carbon fiber reinforced polymer)-to-concrete interface subjected to freeze-thaw cycling, acid attack, and alkali attack. Significant decrease of fracture energy release rate is observed after environmental conditioning. With the increase of freeze-thaw cycles and soaking time, the failure mode of the specimen changes from tensile failure of concrete to adhesive failure along the interface. Test results also confirm that the durability of the CFRP-to-concrete interface can be improved by application of silane coupling agent under freeze-thaw cycling and alkaline condition. 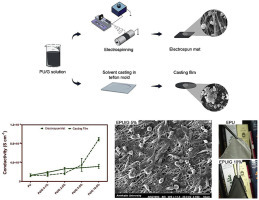 Abstract: Publication date: 1 July 2019Source: Composites Part B: Engineering, Volume 168Author(s): Pei Wang, Guanyu Deng, Hongtao Zhu, Hongbo Zhang, Jian Yin, Xiang Xiong, Xiaoguang Wu Multi-walled carbon nanotube (MWCNT) and carbon fiber and flaky graphite reinforced copper foam/furan resin composite for a novel sliding contact material was fabricated using an acid purify and ultrasonic dispersion technology, followed by a mold pressing process. The microstructure, electrical resistivity, impact strength and current-carrying friction performances of the composites were measured to investigate the effect of the different MWCNT contents. The results showed that the MWCNTs had a good dispersion state in the composite and the percolation threshold was approximate 0.074–0.185 vol%. As addition of the MWCNTs, the impact strength and wear resistance of the composites could be raised by 45% and 22%, respectively. Abstract: Publication date: 1 July 2019Source: Composites Part B: Engineering, Volume 168Author(s): Mateusz Koziol This study presents a new approach method for instrumented drop weight tests, with a central spherical impactor and a circular sample support. The tests were carried out on glass fiber reinforced polymer (GFRP) laminates with three types of reinforcement: plain-woven fabric, stitched plain-woven fabric and 3D non-crimp fabric (NCF). It was found that the plain-woven fabric reinforced laminate showed a more violent destruction mode (a massive fracture crack) in comparison with the other two. The stitched and the 3D NCF reinforced laminates exhibited a better impact resistance manifested by a higher stress at the failure initiation point, and a slower or totally arrested fracture crack growth. The applied methodology proved effective for the evaluation of materials under impact loading conditions. A novel element is the use of fast-frame camera images to measure the displacement of the specimens during the impact. It strongly improved the obtained results and enabled a reliable analysis of the strain-stress progress. Abstract: Publication date: Available online 9 April 2019Source: Composites Part B: EngineeringAuthor(s): Arshad Hussain Khan, Badri Prasad Patel The steady state non-linear response of bimodular composite laminated annular sector plates is investigated using the field consistent eight-noded finite element based on the first-order shear deformation theory and Bert's constitutive model. The periodic forced response is obtained using the modified shooting method and arc-length/pseudo arc-length continuation techniques. Within a shooting cycle, the solution of the governing equation is obtained using Newmark's time integration coupled with Newton Raphson method. The effects of bimodularity, geometric nonlinearity, boundary conditions, load amplitude, lamination scheme and sector angle on the response characteristics are presented. Significantly large difference in the peak amplitudes is predicted with and without geometric nonlinearity. The higher harmonic contributions in the steady state displacement/stresses are demonstrated using frequency spectra and phase plane plots. Through the strain energy plots, the participation of even and odd order harmonics is correlated to the quadratic and cubic restoring forces in a cycle. The total number of degrees of freedom for converged results is 805 for CCCC and 865 for CSCS/SCSC plates resulting in a system seldom treated in the literature on nonlinear steady state periodic response and the results presented may serve as reference for validation of approximate solutions. Abstract: Publication date: Available online 8 April 2019Source: Composites Part B: EngineeringAuthor(s): Aldobenedetto Zotti, Simona Zuppolini, Anna Borriello, Mauro Zarrelli Two different hyperbranched polymer (HBPs) fillers were synthesized and dispersed within an aeronautical graded epoxy matrix as toughening agents. The first typology, identified as HBPG (HBP Glassy) is a glassy polyester characterized by a higher glass transition temperature (Tg) then room temperature (∼90 °C) and obtained by means of bulk polycondensation reaction starting from a diphenolic acid as precursor. The second hyperbranched polymer, labelled HBPR (HBP Rubbery) was a polyamide ester with a Tg of about 20 °C and synthesized by bulk polycondensation of sebacic acid and diisopropanolamine.HBP/epoxy systems were prepared considering two concentration levels, respectively 0.1 and 5 wt%, and the effects on rheological, thermal stability, mechanical properties and fracture toughness were investigated and analyzed in respect to the corresponding neat epoxy.Rheological results revealed that the HBPG filler induces relevant effects on the viscosity of the epoxy matrix compared to HBPR limiting the potential usage of the system for composite manufacturing.Nevertheless, HBPG induces optimal results in term of thermal stability, mechanical and fracture performances, with a limited reduction of the Tg and a higher increase of degradation activation energy along with enhanced fracture behavior as indicated by an enhanced critical stress intensity factor (KIC) and critical strain energy value (GIC). The main result of this work suggests that the HBPG/RTM6 epoxy could be suitably used as polymer matrix for carbon-reinforced composites preserving the advantages of infusion process but at the same time enhancing the matrix-driven mechanical property. Abstract: Publication date: Available online 7 April 2019Source: Composites Part B: EngineeringAuthor(s): Hirshikesh, Sundararajan Natarajan, Ratna K. Annabattula, Emilio Martínez-Pañeda We present a phase field formulation for fracture in functionally graded materials (FGMs). The model builds upon homogenization theory and accounts for the spatial variation of elastic and fracture properties. Several paradigmatic case studies are addressed to demonstrate the potential of the proposed modelling framework. Specifically, we (i) gain insight into the crack growth resistance of FGMs by conducting numerical experiments over a wide range of material gradation profiles and orientations, (ii) accurately reproduce the crack trajectories observed in graded photodegradable copolymers and glass-filled epoxy FGMs, (iii) benchmark our predictions with results from alternative numerical methodologies, and (iv) model complex crack paths and failure in three dimensional functionally graded solids. The suitability of phase field fracture methods in capturing the crack deflections intrinsic to crack tip mode-mixity due to material gradients is demonstrated. Material gradient profiles that prevent unstable fracture and enhance crack growth resistance are identified: this provides the foundation for the design of fracture resistant FGMs. The finite element code developed can be downloaded from www.empaneda.com/codes. Abstract: Publication date: Available online 6 April 2019Source: Composites Part B: EngineeringAuthor(s): J.E. Martín-Alfonso, E. Číková, M. Omastová This work has been focused on the fabrication and characterization of polyvinylpyrrolidone (PVP)/tragacanth gum (GT) fibers prepared by electrospinning technique. The influence of GT amount on the electrospinning of PVP aqueous solutions under different concentrations was studied. Spectroscopic (FTIR and XPS), morphological (SEM) and thermal (DSC and TGA) properties of the electrospun fiber mats were analyzed. In addition, rheological behavior of the polymer solutions was measured to explain the electrospinnability for fiber formation. The results of SEM showed that the GT content exerts an important influence on the fiber morphology. The fiber diameter increased with increasing PVP concentration, whereas the diameter of fibers increased with decreasing GT concentration. One empirical correlation between the diameter of the fibers and the Newtonian viscosity has been proposed. Chemical analysis confirmed the presence of GT in fiber composition and the results of DSC proved that GT influences PVP polymer thermal behavior. Abstract: Publication date: Available online 5 April 2019Source: Composites Part B: EngineeringAuthor(s): J.P. Reis, M.F.S.F. de Moura, R.D.F. Moreira, F.G.A. Silva In this work, interlaminar fracture characterization of carbon-fibre reinforced polyamide composite was studied experimentally and numerically. The double cantilever beam and end notched-flexure tests were performed to determine interlaminar fracture toughness under pure mode I and pure mode II, respectively. Equivalent crack length based procedures were used to assess the Resistance-curves, which allowed obtaining the fracture energies under self-similar crack growth. It was observed that toughness values are markedly higher than the ones obtained for typical carbon-epoxy composites and other thermoset based composites. A cohesive zone model with trapezoidal softening law was employed to simulate the fracture process in both tests. An inverse procedure was followed to determine cohesive parameters defining laws representative of the fracture process. Overall, good agreement was obtained revealing the suitability of the procedure and the appropriateness of the obtained laws. The obtained fracture energies for this thermoplastic composite are quite superior when compared to the thermoset based ones, making this material a promising candidate to replace thermoset matrices in many structural applications. Abstract: Publication date: Available online 4 April 2019Source: Composites Part B: EngineeringAuthor(s): Johannes Görthofer, Nils Meyer, Tarkes Dora Pallicity, Ludwig Schöttl, Anna Trauth, Malte Schemmann, Martin Hohberg, Pascal Pinter, Peter Elsner, Frank Henning, Andrew Hrymak, Thomas Seelig, Kay Weidenmann, Luise Kärger, Thomas Böhlke A virtual process chain for sheet molding compound (SMC) composites is established and validated by means of experimental investigations on a demonstrator structure. The flow in the compression molding step is simulated via a Coupled-Eulerian-Lagrangian approach using an anisotropic non-Newtonian fluid flow model. Evolution of the fiber orientation distribution (FOD) is described by Jeffery's equation. The predicted FOD is mapped to structural simulations employing a neutral data format. A mean-field anisotropic damage model is used to predict the damage evolution in the demonstrator. Simulated FOD at the end of the compression molding is validated by computer tomography. Structural simulations are validated by means of a cyclic four-point bending test on the demonstrator. The predicted results show increased accuracy with the experiments by transferring FOD data within the virtual process chain. Critical points of high damage concentrations leading to failure agree with the experimental observations. Abstract: Publication date: Available online 4 April 2019Source: Composites Part B: EngineeringAuthor(s): Lazaros Tzounis, Michele Zappalorto, Francesco Panozzo, Kyriaki Tsirka, Lucio Maragoni, Alkiviadis S. Paipetis, Marino Quaresimin In the present study, hierarchical single-wall carbon nanotube covered Glass fibres (GF-CNT) are developed for self-sensing Structural Health Monitoring (SHM) of epoxy laminate composites. The unidirectional (UD) CNT-modified glass fibers were fabricated by a versatile and scalable wet-chemical blade coating deposition process under ambient conditions. GF-CNT were employed to manufacture UD damage sensing composite laminates. Scanning Electron microscopy (SEM) revealed an extremely homogeneous CNT nanolayer consisting of highly entangled CNT networks covering fully the GF surfaces. A comprehensive electrical characterization of the manufactured laminate was carried out, revealing a strongly orthotropic response in terms of electrical resistivity. The damage sensing capability of the new developed “smart” reinforcement material was verified taking advantage of mode I Double Cantilever Beam (DCB) tests carried out on specimens with a pre-delamination. The electrical resistance, measured during the tests, exhibited a pronounced increase proportional to the delamination growth. The experimental data were also compared with the assessment of a predictive analytical model, showing a very satisfactory agreement. 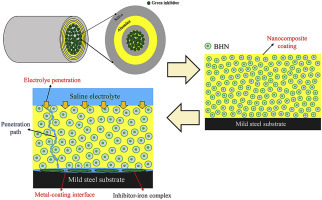 Abstract: Publication date: Available online 4 April 2019Source: Composites Part B: EngineeringAuthor(s): Million Tafesse, Hyeong-Ki Kim The hydration kinetics and shrinkage of carbon nanotube (CNT)/cement composites were investigated experimentally. 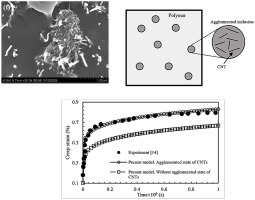 The effect of CNTs mixed in a paste matrix was evaluated in terms of the degree of hydration and heat of hydration to evaluate the overall hydration kinetics. Furthermore, the microstructure and the reaction products were characterized using mercury intrusion porosimetry, X-ray diffraction, and chemical shrinkage for further analysis. Autogenous and dry shrinkages were measured, and the results were analyzed based on the hydration kinetics. The experimental results show that pure CNTs are not capable of activating or delaying the hydration products; rather, they offer a micro-filler capability. In addition, autogenous shrinkage increased despite the amount of added CNTs in some cases. Abstract: Publication date: Available online 4 April 2019Source: Composites Part B: EngineeringAuthor(s): Tuhin Saha, Anil K. Bhowmick, Takeshi Oda, Toshiaki Miyauchi, Nobuhiko Fujii Thermal stability and mechanical characteristic of an elastomer utilized in automotive components require considerable improvement in view of stringent conditions imposed. One of the ways to improve these properties is to fabricate polymer nanocomposites. 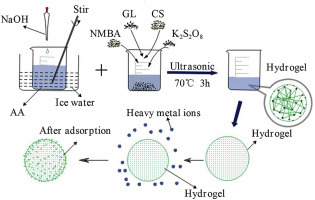 Organically modified clay (Cloisite 30B), and modified graphene (graphene oxide) were introduced into polyacrylicester (ACM) system using solution blending method and their properties were investigated in the presence of these nanofillers. Incorporation of layered nanofillers has enhanced the thermal, dynamic mechanical, mechanical and barrier properties. Furthermore, the mechanical properties of the nanocomposites were estimated by the Halpin-Tsai model. The results were analyzed with high-resolution transmission electron microscopy (HRTEM) and atomic force microscopy (AFM). Proper dispersion of the nanofillers increased the properties of the nanocomposite. This is because of secondary interactions among these nanofillers and the elastomer. To study the effect of nanofiller on the decomposition of ACM, reactive force field (ReaxFF) molecular dynamics simulation was done on the ACM rubber for the first time with model graphene-oxide (GO) molecule. With the introduction of GO molecule, the onset of degradation was enhanced and the rate of degradation was decreased to a considerable extent. This investigation can be useful to various other elastomer systems for the enhancement of thermal stability and mechanical properties. Abstract: Publication date: Available online 3 April 2019Source: Composites Part B: EngineeringAuthor(s): Cosmin Roszkos, Jozef Bocko, Tomáš Kula, Juraj Šarloši This paper presents static and dynamic analyses of closed and open cell aluminum foam geometric models using the homogenization technique and the FEA. The RVE models were designed with regard to: the pore size, cell wall and foam porosity of aluminum foam samples. Static analyses of foam cubes were performed in order to obtain the elastic moduli of the analyzed models. The obtained data was afterwards used for the modal analyses. Two types of models: homogenized beam models and optimized-homogenized beam models; and three types of structures: simple beam, sandwich beam and double sandwich beam were used for these analyses. The purpose of the optimized-homogenized model is to save design and calculation time. The results showed that at lower frequencies the models (homogenized beam and optimized-homogenized beam) reach similar natural frequencies and mode shapes. At higher frequencies the geometric shape and the geometric flaws have a big influence on the results. Abstract: Publication date: Available online 3 April 2019Source: Composites Part B: EngineeringAuthor(s): Andrey V. Azarov, Fedor K. Antonov, Mikhail V. Golubev, Aleksey R. Khaziev, Sergey A. Ushanov The paper is concerned with design, analysis and fabrication of the small size Unmanned Aerial Vehicle composite frame structure. The frame has the form of a lattice composite structure manufactured by 3D printing of continuous carbon fibers and two matrix materials – thermoset, which is used to join the elementary fibers in the tow, and thermoplastic, which consolidates the cured tows into a unidirectional composite. The paper consists of contains the description of the 3D printing procedure, finite element analysis of the structure, test results for mechanical properties of the structural elements and the fabricated frame. The result of analysis is in good agreement with experimental data. Abstract: Publication date: Available online 3 April 2019Source: Composites Part B: EngineeringAuthor(s): T.P. Mohan, K. Kanny The objective of this work was to prepare a natural fiber reinforced composite product by using nanoparticle technique method. Nanoclay particles were infused into the banana fiber and these modified banana fibers were then reinforced in epoxy polymer composites. A short banana fiber reinforced epoxy polymer composite cylinder was prepared by resin impregnation method, and the compressive, tensile, interfacial and energy absorption characteristics were studied. The properties of nanoclay infused banana fiber reinforced composites were compared with alkaline (NaOH) treated and untreated banana fiber reinforced epoxy composites. It was observed that the nanoclay infused banana fiber composites has resulted in 17%, ∼2 times and 43% improved compressive yield stress, modulus and strength when compared with untreated banana fiber reinforced epoxy composite cylinder. However, nanoclay infusion induces brittleness into the fiber affecting the elongational properties. Tensile, flexural and short beam properties show that the reinforcement effect of nanoclay was higher in flexural and short-beam modes when compared with tensile mode, due to higher level of surface interaction of nanoclay particles in flexural and short-beam modes. About 2 times improved energy absorption properties were obtained in nanoclay infused banana fiber reinforced epoxy composites when compared with untreated banana fiber reinforced epoxy composites. Microscopy examination revealed that the nanoclay infusion in fiber improved fiber-matrix interfacial and load transfer characteristics leading to the higher level of property improvement in nanoclay infused banana fiber reinforced epoxy composites. The outcome of the result suggest that the nano-technique is very much useful and can be simply applied onto the natural fibers to realize the potential application of these materials. Abstract: Publication date: Available online 3 April 2019Source: Composites Part B: EngineeringAuthor(s): Phi Long Nguyen, Xuan Hong Vu, Emmanuel Ferrier In civil engineering, when a CFRP-reinforced structure is subjected to fire, both the structure and CFRP are simultaneously affected by elevated temperature and mechanical loading. In the Eurocodes, the strengths of concrete and steel are described to be reduced with increased temperature; however, the codes do not describe the performance of hand-laid CFRP. This paper presents the thermomechanical performance of hand-laid CFRP with and without thermal insulation under different mechanical loading conditions. Experimental tests were conducted to identify the maximum transient heating temperature and duration to which CFRP can be exposed at different levels of mechanical load. The results show that when the applied load increases, the rupture temperature and maximum exposure duration decrease. At 20 °C, the rupture temperature of CFRP gradually decreases when the applied load increases from 10% to 50% of the material's ultimate strength; at room temperature, as the applied load reaches 75% of the ultimate strength, the rupture temperature significantly decreases. Likewise, the exposure duration gradually decreases when the applied load varies from 10% to 50% of CFRP's ultimate strength, and decreases considerably when the applied load is 75% of the ultimate strength. Additional tests were conducted on CFRP protected by an insulation material to characterize the effectiveness of the used insulation material used on the performance of hand-laid CFRP subjected to thermal and mechanical loading. Finite element models were used to investigate the thermal conduction, and these models were successfully validated by the experimental results. Thus, the models were confirmed to predict the fire protection capability of the used insulation material reliably and accurately. Abstract: Publication date: Available online 11 March 2019Source: Composites Part B: EngineeringAuthor(s): E. Ruocco, J.N. Reddy This paper presents an analytical solution for elastic buckling problems of thick, composite prismatic plates subjected to uniaxial or biaxial compressive loads. Based on Reddy's third-order shear deformation theory and the Green-Lagrange deformation measure, the governing equations and natural boundary conditions of the plate are derived using Hamilton's principle, and solved analytically using the Navier and Levy-type solution methods.A large number of configurations are analyzed, and the effects of geometric and material properties on the buckling of both isotropic and orthotropic prismatic plates, as well as transversely anisotropic sandwich plates, are determined with a reduced computational effort. A comparison with results available in the literature, also determined by considering alternative plate models, shows the accuracy of the proposed approach. Abstract: Publication date: Available online 26 February 2019Source: Composites Part B: EngineeringAuthor(s): Chien H. Thai, A.J.M. Ferreira, P. Phung-Van In this study, for the first time, a size dependent computational model based on the modified strain gradient theory (MSGT) and higher-order shear deformation theory (HSDT) for free vibration analysis of multilayer functionally graded graphene platelet-reinforced composite (FG GPLRC) microplates is proposed. To capture size effects of microstructures, three material length scale parameters (MLSPs) are considered and used. The effective Young's modulus for each layer of the FG GPLRC microplate is computed according to the Halpin–Tsai model, while the effective density and Poisson's ratio are computed by the rule of mixtures. Four different types of graphene platelets (GPLs) distributions, which are either uniform or functionally graded (FG), are considered. The principle of virtual work is used to derive discretize governing equations which are then solved by an isogeometric analysis (IGA). In addition, thank to continuous higher-order derivatives of NURBS basis functions in IGA, it is suitable for a numerical implementation of the present size dependent model within required third-order derivatives in the weak form. Besides, the present size dependent model can be recuperated into the modified couple stress theory model (MCST) or classical HSDT model when two or all MLSPs in the theory are taken equal to zeros, respectively. The rectangular and circular FG GPLRC microplates with different boundary conditions, distributed types of GPLs and MLSPs are exampled to evaluate natural frequencies. Numerical results have shown that the difference of the natural frequency predicted by the MSGT, the MCST and classical HSDT are large when the plate thickness approaches the MLSPs, however, this difference decreases with a rise of the plate thickness. Abstract: Publication date: 1 July 2019Source: Composites Part B: Engineering, Volume 168Author(s): M.V. Zhikharev, S.B. Sapozhnikov, O.A. Kudryavtsev, V.M. Zhikharev This paper focuses on a ballistic impact response of composite plates with a thickness of 2 mm subjected to uniaxial tension preload. It also presents experimental and numerical results of ballistic impact response studying. To generate impact damages by a spherical projectile in the range of 100–800 m/s velocities the powder gun stand was used. During the experiments, the ballistic stand was placed in an INSTRON 5882 testing machine for setting five different states of preloading. The results showed that uniaxial tension preload reduces the ballistic limit. Higher tensile preload levels were found out to lead to the smaller delamination area. This is a result of impact energy dissipation in inclined (and damaged during pretension) segments of threads which play the role of dry friction contact areas between fibres. The response time to the rupture of the specimen after penetration depends on a preload level, which was observed as another phenomenon. The finite element simulations of preloaded plates subjected to ballistic impact were carried out using ANSYS Workbench (AUTODYN3D) explicit package. As numerical results were in good agreement with the experimental data, a variation of GFRP ballistic limit with tension up to 92% of strength was numerically investigated. Abstract: Publication date: 1 July 2019Source: Composites Part B: Engineering, Volume 168Author(s): Giuseppe Ferrara, Bartolomeo Coppola, Luciano Di Maio, Loredana Incarnato, Enzo Martinelli The use of Textile-Reinforced-Matrix (TRM) systems is gaining consensus as a possible technical solution for strengthening masonry structures. In this context, the use of natural fabrics (among which those made of flax) instead of synthetic ones can have a positive impact on several sustainability-related aspects, such as renewability, recyclability, biodegradability, low price. However, both mechanical properties and durability performance of natural fibres and fabrics needs to be further investigated with the aim to make it possible their use in composites for construction. 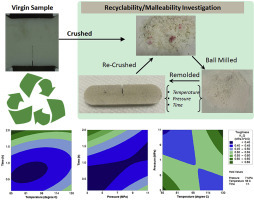 Furthermore, this paper reports the results of a fundamental study on a bidirectional flax fabric eventually intended as the reinforcement in cement-based composite systems. Specifically, it aims at determining the tensile strength of flax of fibres, threads and the fabrics, and investigating how they are influenced by various environmental exposures and aging processes. The results in the experimental tests reported herein show that fibres and fabrics suffered no significant reduction in tensile strength due to the considered environmental exposure. Despite the common belief that natural fibres may be affected by durability issues, the results demonstrate that the flax fabric under investigation can be utilised as a reinforcement in TRM systems, which is the main novelty and original contribution of this paper. 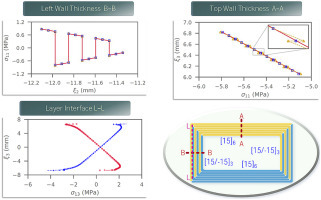 Abstract: Publication date: 1 July 2019Source: Composites Part B: Engineering, Volume 168Author(s): Mohammad Arefi, Timon Rabczuk Nonlocal higher order electro-elastic bending analysis of a piezoelectric doubly curved nano shell is studied in this paper based on nonlocal elasticity theory and third order shear deformation theory. Nonlocal piezo-elasticity relations are used for size-dependent analysis of the piezoelectric structure. One can conclude that combination of important theories such as Reddy's shear deformation theory, nonlocal piezoelasticity theory to a more complicated structure such as doubly curved shells leads to an important and novel work in context of mechanical engineering. The kinematic relations are used based on third order shear deformation theory of Reddy. The doubly curved piezoelectric nano shell is subjected to transverse loads and applied voltage. In addition, the structure is resting on Winkler-Pasternak foundation. The governing equations of nonlocal electro-elastic bending are derived based on principle of virtual work. The nonlocal electro-elastic bending results of doubly curved nano shell are investigated using Navier's method. Influence of nonlocal parameter, applied electric potential, Winkler and Pasternak's parameters of foundation is studied on the mechanical and electrical components of the piezoelectric doubly curved nano shell. Abstract: Publication date: 1 July 2019Source: Composites Part B: Engineering, Volume 168Author(s): Chen-Yang Dang, Xiao-Jun Shen, Hui-Jie Nie, Shu Yang, Jian-Xiang Shen, Xiao-Hui Yang, Shao-Yun Fu To improve interlaminar shear strength (ILSS) of ramie fiber (RF) reinforced polypropylene (PP) composites, graphene oxide (GO) with different particle sizes (ca. 1, 5 and 40 μm) are employed to treat the RF surfaces. Untreated and GO-treated RF/PP composites are then prepared by hot press. The combined effect of the GO size and content is examined on the ILSS of the RF reinforced PP composites. 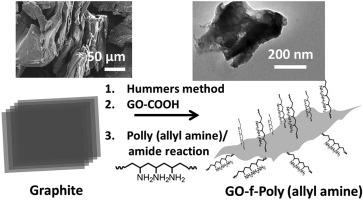 Moreover, the wrinkle morphology of GO surfaces is considered to play a mechanical interlocking role in improving the interfacial bonding between RFs and PP matrix, thus enhancing stress transfer from the PP matrix to the RFs. Consequently, the observed maximum improvement of about 40% in the ILSS of the PP composite by GO treatment of appropriate size and content is reasonably interpreted mainly via GO aspect ratio, GO aggregation and PP crystallinity. Abstract: Publication date: 1 July 2019Source: Composites Part B: Engineering, Volume 168Author(s): Dipak Kumar Jesthi, Ramesh Kumar Nayak Glass fiber reinforced polymer composites (GFRPC) possess low strength in comparison to carbon fiber reinforced polymer composites (CFRPC). The degradation of the mechanical properties of seawater aged GFRPC is more than that of CFRPC. However, CFRPC is not commercially viable for all type of applications due to its high cost. Therefore, there is a need to hybridize carbon fiber with glass fiber to overcome the weakness of glass fiber reinforced polymer composites for marine application. In this investigation, there are five types of composites were considered, i.e., plain glass ([G]s), plain carbon ([C]s), [G3C2]S, [G2C2G]S and [GCG2C]S type of hybrid composites. The composites were seawater aged for 90 days. The results revealed that the tensile strength of seawater aged [GCG2C]S type hybrid composite was improved by 14% as compared to plain GFRPC. The flexural strength and modulus of seawater aged [GCG2C]S type hybrid composite were enhanced by 43% and 64% respectively in comparison to plain GFRPC. However, the impact strength of seawater aged [GCG2C]S type hybrid composites was reduced by 44.5% as compared to plain GFRPC. Furthermore, the structure-properties co-relationship was established from field emission scanning electron microscopy images. 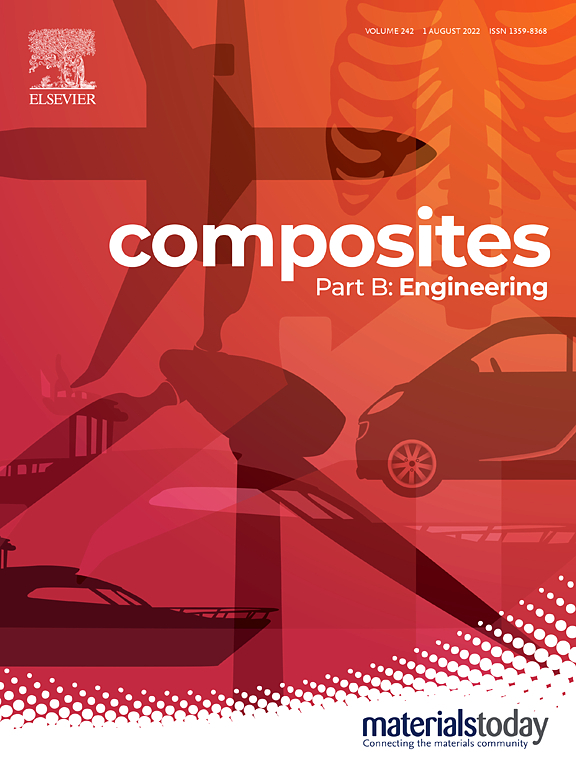 Abstract: Publication date: 1 July 2019Source: Composites Part B: Engineering, Volume 168Author(s): Yongming Yang, Hugo Biscaia, Manuel.A.G. Silva, Carlos Chastre Deterioration of adhesively bonded CFRP/steel systems in salt fog environment, i.e., deicing salts and ocean environments, has to be taken into account in the design of steel strengthened structures. In the present work, monotonic and quasi-static cyclic loading were applied to CFRP-to-steel double strap joints for two kinds of CFRP laminates after being aged for a period of 5000 h to evaluate the bond behavior. The bonded joints exposed to salt fog had a different failure mode than that observed in the control specimens (0 h of exposure). The severe reduction of the maximum bond stress resulted from damage initiation that occurred in the corrosion region of the steel substrate, associated with final partial rupture on the corroded steel substrate around the edge of the bonded area: it was also correlated with reduced load carrying capacity. Results of pseudo-cyclic tests showed that the relationship between a local damage parameter (D) and normalized local dissipated energy (Wd/Gf) and the normalized slip increment (ΔS/ΔSult) exhibited almost the same trend in the un-aged and aged bonded joints. The normalized slip increment can be seen as a direct indicator for the local and global damage for the un-aged and aged bonded joints. However, monotonic and quasi-static cyclic tests results revealed that the stress concentration due to local corrosion of steel substrate could lead to brittle rupture or accelerated cumulative damage once the aged bonded interface had become weaker. The bonded joints have exhibited also a smaller relative deformation capacity between CFRP and steel. Abstract: Publication date: 1 July 2019Source: Composites Part B: Engineering, Volume 168Author(s): Roberto Scaffaro, Andrea Maio Herein, we prepared an integrated ternary bionanocomposite based on polylactic acid (PLA) as a host polymer and two different forms of carbon fillers, i.e. graphene nanoplatelets (GNPs) and carbon nanotubes (CNTs), used simultaneously at extremely low concentrations, relying on the synergistic effect of CNT and graphene nanoreinforcement and a novel, multi-step procedure to achieve a high level dispersion. The results indicated that this multi-step approach allows stiffness increments up to +66%, with simultaneous enhancement of tensile strength (up to +44%), and elongation at break (up to +36%) with respect to neat PLA, by adding an extremely low content (0.5 wt%) of a hybrid combination of CNTs and GNPs. The development of a multistep strategy to achieve molecular level dispersion of multifunctional nanoparticles integrated in a fully renewable polymer matrix allows the premise of industrial-scale production of advanced bionanocomposites with outstanding properties at extremely low loadings. 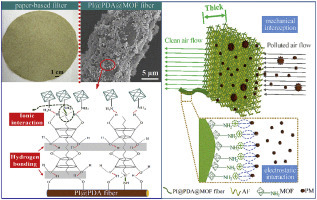 Abstract: Publication date: 1 July 2019Source: Composites Part B: Engineering, Volume 168Author(s): Masoud Faraji, Hossein Mohammadzadeh Aydisheh Flexible and lightweight PVC-MWCNTs-PANI nanocomposite film with highly porous 3D network structure and good capacitive behavior was easily fabricated via uniform adding of Azodicarbonamide (ADC) as a foaming agent into structure of Polyvinyl chloride-Multi walled carbon nanotubes-Polyaniline composite. ADC in the composite film can be decomposed to various volatile gases under a controlled temperature, resulting in the formation of porous structure for the PVC-MWCNTs-PANI film with high surface area. The flexible porous PVC-MWCNTs-PANI film showed much higher specific capacitance value of 837 mF cm−2 with 89% retention after 2000 cycles at a current density of 2.4 mA cm−2 compared to the flexible non-porous PVC-MWCNTs-PANI film prepared without the foaming process (153 mF cm−2 with 90% retention). Furthermore, the porous PVC-MWCNTs-PANI film could possess energy density of 74.4 μWh cm−2(31 Wh kg−1) and power density of 0.96 mW cm−2(400 W kg−1). 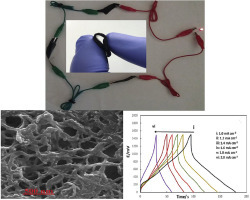 A flexible symmetric supercapacitor device made from two flexible porous PVC-MWCNTs-PANI films with the solid-state PVA/H2SO4 electrolyte exhibited high electrochemical performance. The enhanced supercapacitive performance of the obtained flexible device is due to the synergistic effect of PANI with MWCNTs, the porous 3D network structure and high wettability of the flexible films.Graphical abstractPolyvinyl chloride-Multi walled carbon nanotubes-Polyaniline composite film for solid-state flexible supercapacitor. Abstract: Publication date: 1 July 2019Source: Composites Part B: Engineering, Volume 168Author(s): Byeong-Min Ahn, Cheol-Woo Ahn, Byung-Dong Hahn, Jong-Jin Choi, Yang-Do Kim, Sung-Ki Lim, Keeyoung Jung, Yoon-Cheol Park, Joon-Hwan Choi A sodium metal chloride battery is one of the promising candidates in the battery energy storage system which has gained considerable attention due to the global interest about environment. An easy approach is shown, in this study, to obtain the low cost and high cell capacity in a Na-(Ni,Fe)Cl2 battery. It is the usage of Fe particles which are larger than Ni particles. Consequently, the Ni content is significantly decreased to be approximately 50 wt % in the Na-(Ni,Fe)Cl2 cell, and this cell shows an excellent cell capacity of 263 mAh g−1 (per the weight of Ni-Fe composites). In general, the Ni content is 86–100 wt % in a Na-(Ni,Fe)Cl2 [or Na-NiCl2] battery. Especially, in this manuscript, a simple test cell is also suggested for the study of active materials in a Na-MCl2 (M: metal) battery. Until now, it has been difficult to study a sodium metal chloride battery in a small-and-academic laboratory, since a lot of exclusive equipment is necessary to assemble the cell. It is expected that this simple test cell can assist the study of a sodium metal chloride battery in an academic laboratory. Abstract: Publication date: 1 July 2019Source: Composites Part B: Engineering, Volume 168Author(s): Enrico Panettieri, Marco Montemurro, Anita Catapano This work proposes a new formulation of blending constraints, in the framework of the multi-scale two-level (MS2L) optimisation strategy for composites. This approach aims to optimise simultaneously both geometrical and mechanical parameters of the laminate at each characteristic scale (macroscopic and mesoscopic ones). In particular, this study deals with the first level of the MS2L optimisation strategy which focuses on the laminate macroscopic scale. At this scale, the behaviour of the laminate is described in terms of the polar parameters of each constitutive stiffness matrix in the framework of the First-order Shear Deformation Theory (FSDT). Therefore, blending constraints are formulated as equivalent mechanical requirements to be imposed to both polar and geometric parameters of the laminate within the first-level problem. The effectiveness of the proposed approach is tested on a meaningful benchmark: the least-weight design of a composite wing-box subject to constraints of different nature. The optimised solutions provided by the MS2L design strategy are characterised by a weight saving of about 12% (when compared to the reference solution taken from the literature) by meeting the full set of feasibility, manufacturing and mechanical requirements. Abstract: Publication date: 1 July 2019Source: Composites Part B: Engineering, Volume 168Author(s): Shuang Xia, Xiaobing Liu, Jianfeng Wang, Ze Kan, Hong Chen, Wenxin Fu, Zhibo Li In order to study the effect of nanoparticle shape on the mechanical properties of polymer-matrix composites, two types of poly(ethylene glycol) (PEG) grafted silica nanoparticles, i.e., nanoplatelets and nanospheres, with similar surface characteristics are prepared through biomimetic synthesis. These two nanoparticles are then incorporated into amorphous poly(D,l-lactide) (PLA for short) as nano-fillers. SEM images confirm the uniform distribution of polymer grafted nano-fillers in PLA-matrix. The tensile tests results show that the elongation-at-break of nanoplatelets/PLA is almost twice as high as that of nanospheres/PLA at the loading level of 1.8–2.4 vol%, indicating that nanoplatelets have much more significant toughening effect than nanospheres. 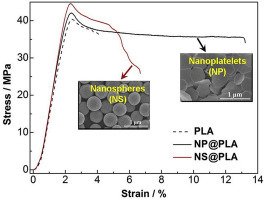 The following comparative analysis demonstrated that two nanoparticles exhibit different behaviors during shear yielding of PLA, leading to different ways of energy dissipation and toughening. In addition, the creep behaviors and dynamic mechanical properties are also closely related to the shape of nanoparticles.Graphical abstractPEG grafted nanoplatelets and nanospheres prepared through biomimetic strategy are incorporated into PLA as nano-fillers. The effect of particle shape on mechanical properties of two nanocomposites is systematically investigated in present research. Abstract: Publication date: 1 July 2019Source: Composites Part B: Engineering, Volume 168Author(s): A.G. de Miguel, A. Pagani, E. Carrera The present work introduces a numerical approach for the study of the free-edge effects that arise in generic laminated composites with arbitrary geometries. The model is based on the use of a higher-order beam theory that employs only displacement unknowns over the cross-section domain, the so-called Lagrange expansion (LE). This allows for the representation of arbitrary sections of laminated structures through a two-dimensional distribution of mathematical domains, accounting for layerwise (LW) kinematics and high refinements towards the free edges. Subsequently, the finite element method (FEM) is employed to solve the problem along the laminate's length, thus enabling the user to introduce arbitrary boundary conditions. Benchmark solutions of the free-edge stresses in symmetric laminates under extension, bending and twisting are included to assess the model. Then, new solutions of a composite C-section beam made of an asymmetric lamination are provided. Abstract: Publication date: 1 July 2019Source: Composites Part B: Engineering, Volume 168Author(s): H.M. Chong, Z.A. Wu, S.P. Ng, A.S. Subramanian, T. Liu, S. Feih Reliable composite repair processes are a necessity to support the operation of next generation lightweight commercial aircraft. In-situ soft patch repairs of aerospace structures made from carbon fibre reinforced polymers require curing of conventional autoclave prepreg materials in an out-of-autoclave environment, which can result in poor repair quality. We demonstrate that the use of a double vacuum debulking (DVD) pre-curing step for soft patch repairs can essentially achieve void-free repairs for prepreg materials with moderate to high solvent residue. Porosity reductions translated into an increase in flexural and interlaminar strength properties of 7.3% and 14.8%, respectively. The repair quality improvement due to void reduction in both soft patch and adhesive film resulted in a 19% increase in tensile repair strength. The work presented demonstrates the need to include a DVD pre-curing step to achieve the stringent manufacturers' repair porosity limits and performance requirements for highly loaded composite aircraft structures. Abstract: Publication date: 1 July 2019Source: Composites Part B: Engineering, Volume 168Author(s): Elsa Piollet, Edith Roland Fotsing, Annie Ross, Guilhem Michon This article investigates the use of a recently developed fibrous core material to increase vibration damping in sandwich beams. The entangled cross-linked fibre (ECF) material is made of short carbon fibres cross-linked with epoxy resin. Dry friction between fibres provides energy dissipation when the material is deformed. Previous measurements on the material are post-processed to provide a simplified viscoelastic description of the material, for an easier interpretation of subsequent structural testings. Two sandwich beams are compared with reference honeycomb beams: a sandwich beam with an ECF core, and a hybrid beam with a honeycomb core and an ECF insert. Steady-state tests are performed on both types of beams to obtain their frequency responses for different excitation levels, and the corresponding apparent loss factors are computed. The beam with a full ECF core shows an apparent loss factor more than ten timess higher than the reference honeycomb beam. The hybrid sandwich beam provides an apparent loss factor four times higher than the reference honeycomb beam. All beams exhibit nonlinear softening responses consistent with a dry friction phenomenon in the material: the resonance frequencies decrease with increasing excitation amplitude, and damping increases then decreases again at very high amplitudes while remaining largely superior to that of the honeycomb beams. Transient impact testings are also presented for a qualitative comparison of the ECF and reference beams, and the ECF beams lead to shorter decay times compared to the reference beams. Abstract: Publication date: 1 July 2019Source: Composites Part B: Engineering, Volume 168Author(s): Jikui Zhang, Xianglin Zhang, Xiaoquan Cheng, Yanwei Hei, Liying Xing, Zhibao Li Carbon nanotubes can be used to protect composites from lightning strike due to their high electrical conductivity. A kind of carbon nanotube film was developed to protect composite structures here. Its lightning strike protection effect was studied. Artificial lightning strike tests were conducted on carbon nanotube film protected specimen, traditional surface silver coating protected specimen and pristine specimen in this paper. Coupled thermal-electrical finite element models were established to study the lightning strike protection effect and damage mechanism of two kinds of methods. Numerical results agree well with experimental ones, illustrating the validity of the models. The results show that lightning strike damage in the carbon nanotube film protected laminate is restricted in 5 composite piles and 5 carbon nanotube films close to the lightning strike surface. Whereas lightning strike damage in surface silver coating protected specimen is restricted in coating and 2 composite piles close to the lightning strike surface. Compared with the pristine laminate, damage in the laminate with carbon nanotube films decreases by 77.6% and 68.0% in area and depth respectively, whereas damage in the laminate with surface silver coating decreases by 66.1% and 92.0% correspondingly. The inserted carbon nanotube films can increase the electrical conductivity and conduct the strike current and energy along both depth and in-plane directions quickly, while surface silver coating mainly conducts the energy along in-plane direction. Abstract: Publication date: 1 July 2019Source: Composites Part B: Engineering, Volume 168Author(s): Neng-Jian Huang, Cheng-Fei Cao, Yang Li, Li Zhao, Guo-Dong Zhang, Jie-Feng Gao, Li-Zhi Guan, Jian-Xiong Jiang, Long-Cheng Tang Flame-retardant silane-grafted-graphene oxide (silane-GO) papers are fabricated via a green and versatile silane-assisted assembling strategy, and their use as early fire alarm sensors are investigated. Different silane molecules with alkoxy groups can react with GO in aqueous solution via hydrolysis and condensation reactions and thus assemble into the aligned silane-GO papers. The silane-GO papers exhibit good mechanical flexibility, strong acidic/alkaline tolerance, excellent flame resistance and improved thermal stability at low silane content in comparison with pure GO paper. Structure observation and analysis disclose that a compact nano-silica protective layer transformed from the grafted silane molecules during combustion is formed to inhibit the thermal degradation of GO sheet effectively. Furthermore, the insulating silane-GO paper can be thermally reduced into the conductive reduced GO network after encountering high-temperature or flame situation, thus providing ideal early fire alarm response, i.e. rapid flame detecting response time of ∼1.6 s and fire early warning response of ∼5 s when attach on the heat resistor. 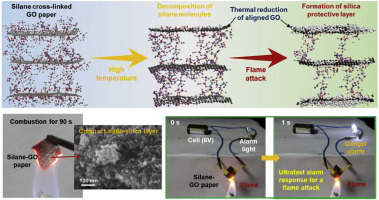 These results suggest that the silane-GO papers are promising for development of advanced materials as smart sensors in early fire alarm applications.Graphical abstractA facile and green silane-assisted assembling technique was developed to fabricate flame-retardant graphene oxide papers, showing fast flame detection and ideal early warning response. Abstract: Publication date: 1 July 2019Source: Composites Part B: Engineering, Volume 168Author(s): Mohammad Arefi, Masoud Kiani, Timon Rabczuk Bending analysis of a sandwich plate is studied in this paper based on first order shear deformation theory and nonlocal strain gradient theory. The sandwich nanoplate is including a porous core and two piezomagnetic facesheets. It is assumed that nanoplate is resting on Pasternak's foundation. Power law function is used to describe change of porosity along the thickness direction. To account size dependency, nonlocal strain gradient theory is employed to predict this behavior. The principle of virtual work is used to derive governing equations in terms of primary functions. A nonlocal parameter and a strain gradient parameter are employed to describe both stiffness reduction and stiffness enhancement of nanoplates. The analytical solution is presented to solve seven governing equation using Navier’s solution. 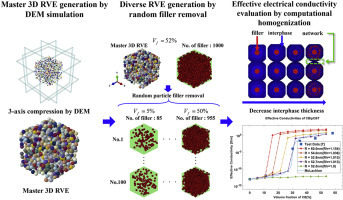 The numerical results are presented to evaluate the effect of various distribution of porosities, porosity volume fraction, nonlocal and strain gradient parameter, electric and magnetic potentials, geometrical characteristics, and parameters of foundation on the results of problem. Abstract: Publication date: Available online 14 January 2019Source: Composites Part B: EngineeringAuthor(s): Jiang-Bo Bai, Di Chen, Jun-Jiang Xiong, Chen-Hao Dong This paper seeks to present a semi-analytical model for predicting the nonlinear tensile properties of corrugated flexible composite skin (FCS) within large deformation range based on iterative integration procedure. The FCS is constructed with two thin-walled curved fibre-reinforced-plastics (FRP) composite shells with a biaxially symmetrical lenticular cross-section, which can be stretched largely along the corrugated direction through pure elastic deformation. Analytical formulations for tensile stiffness of the FCS are derived based on the unit virtual load method, and geometrical equations are established to describe tensile deformation of the FCS. By means of linear elastic and strain energy theory, new geometry and tensile force increment of extended FCS are calculated at a given small increment of tensile displacement. In order to obtain the tensile behaviour of the FCS within large deformation range, semi-analytical model is presented by using the iterative calculation, and then is verified from experiments. Finally, the effect of the geometry on tensile behaviour of the FCS is analyzed numerically. Abstract: Publication date: 1 July 2019Source: Composites Part B: Engineering, Volume 168Author(s): D. Garoz, F.A. Gilabert, R.D.B. Sevenois, S.W.F. Spronk, W. Van Paepegem This paper presents an implementation-dedicated analysis of Periodic Boundary Conditions (PBCs) for Finite Element (FE) models incorporating highly non-linear effects due to plasticity and damage. This research addresses fiber-reinforced composite materials modeled at micros-scale level using a Representative Volume Element (RVE), where its overall mechanical response is obtained via homogenization techniques. For the sake of clearness, a unidirectional ply with randomly distributed fibers RVE model is assumed. PBCs are implemented for implicit and explicit FE solvers, where conformal and non-conformal meshes can be used. The influence of applying PBCs in the reliability of the mechanical response under tension and shear loading is assessed. Furthermore, the Poisson effect and the consistency of damage and fiber debonding propagation through the periodic boundaries are reported as well as their impact on the homogenized results. Likewise, numerical aspects like computational performance and accuracy are evaluated comparing implicit- versus explicit-based solutions. Abstract: Publication date: 1 July 2019Source: Composites Part B: Engineering, Volume 168Author(s): Abdel-Hamid Ismail Mourad, Amir Hussain Idrisi, Maria Christina Wrage, Beckry Mohamed Abdel-Magid The long-term durability of E-glass/epoxy and E-glass/polyurethane composites in seawater environment were investigated. Samples were conditioned for ninety months (7.5 years) in seawater at room temperature and at an elevated temperature of 65 °C. Changes in mechanical properties are reported and discussed. At room temperature, the tensile strength of the glass/epoxy composite decreased at a very low rate to 94% of its original strength after 7.5 years of immersion in seawater. At an elevated temperature of 65 °C, the strength decreased rapidly to 53% of its original value after five years, then decreased by only 1% between five and seven and a half years. The strength of the E-glass/polyurethane composite started to decline immediately and also reached bottom after five years of immersion where the strength dropped by 34% at room temperature and by 63% at 65 °C. No significant change was observed in the tensile modulus of both composites. The strain-at-failure of both composites increased gradually with water absorption, then dropped to about 50% of its original value after ninety months. After extended exposure to seawater, both composites exhibited brittle failure; and results show that the elevated temperature accelerated the degradation in the matrix and at the fiber/matrix interface. However, it is noted that at room temperature the E-glass/epoxy retained 94% of its strength and the E-glass/polyurethane retained nearly 63% of its strength after 7.5 years of immersion in seawater. Abstract: Publication date: 1 July 2019Source: Composites Part B: Engineering, Volume 168Author(s): Yijie Liu, Shengkai Su, Huaiwei Huang, Yingjing Liang Porosity of functionally graded materials (FGMs) is usually aroused by fabrication defects. It had been proven that the porosity has a significant influence on the static responses of their structures, but the effects of porosity on buckling behaviors are still worth investigating. To reveal these effects, the thermal-mechanical coupling buckling issue of a clamped-clamped porous FGM sandwich beam is investigated in this paper by employing the high-order sinusoidal shear deformation theory. The modified Voigt mixture rule is used to approximate the temperature-dependent material properties of porous FGMs. The physical neutral plane of FGM sandwich beams is taken into account to reflect the actual condition of the structures and simplify the calculation. The thermal environments are considered as uniform, linear and nonlinear temperature rises, and both the temperature-independent and temperature-dependent material properties are discussed in order to justify the importance of the thermal-mechanical coupling effect. An iterative algorithm is used to solve the thermal-mechanical coupling critical buckling temperature. The present theoretical results are verified by comparing with the literature and ABAQUS results, and the effects of porosity, the physical neutral plane, gradient index, material temperature dependence, sandwich structural parameters are discussed. Results show that for buckling issue excluding the pre-buckling deformation effect, considering either the physical neutral plane or the geometrical middle plane of FGM beams would produce alike critical buckling temperatures. With the rise of porosity, the critical temperature increases greatly, which is quite different from the changing rule observed in the buckling issue of inplane-loaded porous FGM plates in literature. The beam with a smaller face-to-core ratio is more sensitive to the change in porosity. Moreover, to improve the thermal buckling load of FGM beams, ceramic constituents with the lower thermal expansion coefficient would be preferred. Abstract: Publication date: 1 July 2019Source: Composites Part B: Engineering, Volume 168Author(s): Miguel A. Machado, Kim-Niklas Antin, Luís S. Rosado, Pedro Vilaça, Telmo G. Santos This paper presents the development and the results of a customized eddy current (EC) non-destructive testing (NDT) system for highly demanding online inspection conditions. Several planar eddy current array probes were designed, numerically simulated and experimentally compared for the inspection of low conductivity unidirectional carbon fibre reinforced polymer (CFRP) ropes. The inspections were performed using a dedicated scanner device at 4 m/s with 3 mm probe lift-off where defects under 1 mm were detected with an excellent SNR. Different defect morphologies and sizes, such as broken fibres and lateral cuts, were successful detected and compared to conventional probes. Abstract: Publication date: 1 July 2019Source: Composites Part B: Engineering, Volume 168Author(s): Dong Gi Seong, Chul Kang, Seong Yeol Pak, Chai Hwan Kim, Young Seok Song We explored how the fiber lengh affects physical properties of three phase polymer composites. The composites including glass fibers, graphites and poly(propylene) were produced via injection molding. The fiber length and its distribution were analyzed before and after molding. Two different fiber lenghs (i.e., 2 mm and 10 mm) were adopted in this study. The morphological analysis of the samples was carried out to evaluate the fiber orientation depending on the fiber length. The thermal, mechanical, and viscoelastic behaviors of the composites were analyzed experimentally. The finding revealed that the longer fiber reinforced composites showed higher viscoelastic properties, Young's modulus, and melting temperature but showed less uniform distribution of fibers. In addition, numerical simulation was conducted to help understand the experimental results. Abstract: Publication date: 1 July 2019Source: Composites Part B: Engineering, Volume 168Author(s): Muhammad Riaz Ahmad, Bing Chen, Jiang Yu This study investigated the influence of ultrafine fly ash (FA) on the mechanical properties, elevated temperature resistance and water stability of basalt fiber reinforced magnesium phosphate cement, and synergy mechanism was examined with the help of X-ray diffraction (XRD), thermogravimetric analysis (TGA), mercury intrusion porosimeter (MIP) and scanning electron microscopy energy dispersive spectroscopy (SEM/SEM-EDS) analysis techniques. Experimental results showed that incorporation of FA improved the mechanical properties, temperature resistance and water stability of MPC composites. TGA results exhibited that the mass loss of MPC composites was gradually reduced by increasing the percentage of FA. MIP analysis showed that cumulative pore volume, volume percentage of large pores and mean pore diameter of were decreased with the addition of FA. XRD and SEM-EDS analysis of MPC composites revealed the formation of secondary reaction products, that could be possibly responsible for the superior properties of FA/MPC composites. Importantly, the results of all characterization techniques corroborated with the mechanical results of MPC composites. Abstract: Publication date: 1 July 2019Source: Composites Part B: Engineering, Volume 168Author(s): Farhad Ahmadijokani, Akbar Shojaei, Mohammad Arjmand, Yasaman Alaei, Ning Yan The phenolic-based brake friction composites containing 0, 1, 2 and 4 vol% carbon fiber were fabricated in this study. Thermogravimetric analysis (TGA) revealed the adverse impact of carbon fiber on the thermal stability of the composites under air atmosphere. Differential scanning calorimetry (DSC) of the uncured samples indicated the positive impact of carbon fiber on the crosslink density of the phenolic resin. Viscoelastic results drawn from the dynamic-mechanical analysis (DMA) suggested that inclusion of carbon fiber increased the storage modulus and decreased the damping factor of the frictional composites. The tribological behavior of the specimens was assessed with a chase type friction tester. Both the friction coefficient and specific wear rate decreased with enhancing carbon fiber content. Furthermore, carbon fiber deteriorated the fade behavior of the developed composites. The TGA, DSC and DMA results were used to justify and interpret the observed tribological behavior. Abstract: Publication date: Available online 20 December 2018Source: Composites Part B: EngineeringAuthor(s): Pingyu Zhu, Xiaobo Xie, Xiaopeng Sun, Marcelo A. Soto A smart structure based on carbon fiber reinforced polymer (CFRP) embedding optical fibers is proposed for distributed sensing in structural health monitoring. The proposed CFRP package provides mechanical protection to the optical fiber, enables temperature-strain discrimination, and also facilitates the sensor's installation to secure reliable measurements. Experimental results verify a linear strain sensor response with temperature compensation, agreeing well with the response of strain gauges and the expected theoretical behavior. The smart structure can be used by gluing it on the surface of the monitored structure or by embedding it as one of the layers used during manufacturing big composite structures. Abstract: Publication date: Available online 18 December 2018Source: Composites Part B: EngineeringAuthor(s): Jinzhang Liu, Zehui Liu, Ming Li, Yi Zhao, Guangcun Shan, Mingjun Hu, Dezhi Zheng Elastomeric matrix filled with carbon nanotubes or graphene has been focused for making resistive-type strain sensors. Here, we report the low-cost synthesis of 3D carbon nanosheet frameworks by exploiting the chemical reaction between magnesium powder and carbon disulfide vapor, and prepared piezoresistive nanocomposites of as-prepared carbon nanomaterials and polydimethylsiloxane elastomer for tensile and compressive strain sensors with different device configurations. The optimal carbon content in PDMS for achieving high sensitivity is obtained. The tensile strain sensor shows fast response and high gauge factor in the order of 102. The compressive strain sensor that is elaborated designed as in-plane and miniature concept also shows striking response to external loads. Abstract: Publication date: Available online 18 December 2018Source: Composites Part B: EngineeringAuthor(s): Shamsad Ahmad, Mehboob Rasul, Saheed Kolawole Adekunle, Salah U. Al-Dulaijan, Mohammed Maslehuddin, Syed Imran Ali In the present study, ultra-high performance concrete (UHPC) mixtures reinforced with varying dosage of steel fibers were considered for studying the effects of exposure duration and fiber content on mechanical properties of the mixtures subjected to a sustained pre-spalling elevated temperature of 300 °C for different durations. Test results showed an increase in compressive strength and modulus of toughness even after exposing to elevated temperature for 5 h. However, modulus of elasticity and flexural strength decreased significantly with increase in exposure duration. The experimental data were statistically analyzed using analysis of variance (ANOVA) method to examine the effects of fiber content and exposure duration on the mechanical properties. Empirical equations were obtained with excellent degrees of fit correlating the mechanical properties of UHPC mixtures with fiber content and exposure duration. Abstract: Publication date: Available online 18 December 2018Source: Composites Part B: EngineeringAuthor(s): Zheng Zhao, Bei Zhang, Fengnian Jin, Jiannan Zhou, Hailong Chen, Hualin Fan To improve the anti-blast ability of sheet molding compound (SMC) protective structure, basalt fiber reinforced polymers (BFRPs) are applied to strengthen SMC and improve its stiffness and strength. To simultaneously guarantee the overall and local rigidities, the panel adopts hierarchical orthogrid-stiffened structure. Explosion experiments were carried out to reveal the blast resistance of the BFRP reinforced SMC door. With much lighter mass, the BFRP-SMC protective door exhibits excellent anti-balst ability and would be an ideal substitute for metallic or concrete protective doors. Equivalent method based on identical volume and mode superposition was adopted to build dynamic theory of blast-loaded hierarchical stiffened panels. Equivalent static load method was adopted to predict the maximum displacement of the blast-loaded panel. These two methods are reliable and provide simple ways to design hierarchical stiffened composite protective structures. Abstract: Publication date: Available online 18 December 2018Source: Composites Part B: EngineeringAuthor(s): Xiaofei Zhang, Xuan Wu, Yunze He, Shuming Yang, Sheng Chen, Shigang Zhang, Deqiang Zhou The impact damage of carbon-fiber-reinforced polymers (CFRPs) must be considered important in order to avoid catastrophic accidents. Low-velocity impact commonly results in barely visible impact damages (BVIDs) in a CFRP component, and is impossible to be detected by visual inspection or machine vision. To rapidly and effectively detect BVIDs in CFRPs, this work proposes a damage inspection method based on an ultrasound wave distortion indicator. The indicator reveals ultrasound higher harmonics, subharmonics, and self-modulation caused by local damage in CFRPs. The experimental system was built after the proposed non-destructive testing (NDT) methodology was introduced. An intact CFRP plate specimen, and specimens with BVIDs and visible impact damage (VID) were tested using the proposed method. The relationship between impact energies and the ultrasound wave distortion indicator was built. The proposed method could provide an effective inspection means for assessing the impact damage of CFRP materials. Abstract: Publication date: Available online 17 December 2018Source: Composites Part B: EngineeringAuthor(s): Mengqian Sun, Diane Wowk, Christopher Mechefske, Il Yong Kim A new analytical modelling method for the study of low-velocity impact response in honeycomb sandwich panels with metallic face-sheets is proposed by using Hamilton's principle. A modified Lagrange's function for this model is then proposed by extending the application of Hamilton's principle from elastic bodies to face-sheets with plasticity. The internal physical mechanism in the system is proved to be reasonable by comparing the energy converting history with published data. This study advances the understanding of the role of face-sheet plasticity in low-velocity impact response of honeycomb sandwich panels by having the ability to incorporate either the energy absorption from elastic deformation or the energy dissipation from plastic deformation of the face-sheet depending on the severity of the damage state in the dented region. The predicted maximum deflection and impact force history are compared with published experimental and finite element results, and lower and upper bounds of the maximum dent depth are obtained. Abstract: Publication date: Available online 17 December 2018Source: Composites Part B: EngineeringAuthor(s): A.R. Jac Fredo, R.S. Abilash, Femi Robert, A. Mythili, C. Suresh Kumar In this work, the strength of the composite material is tested and the damages are classified using supervised method. The image is obtained from the front and rear sides of the composite material after applying 5 mm, 6 mm and 7 mm impingement. Initially, the images are filtered using anisotropic diffusion filter. Global and local damages in the structures are segmented using Fuzzy C-Means (FCM) clustering method. Geometrical features and Zernike Moments (ZM) are calculated from the delineated regions. The performance of the features is tested using Support Vector Machine classifier. Results show that the FCM with three and four cluster centres is able to segment the global and local damages respectively. The global damages due to different impinges are classified better compared to the local damages. The global damages in the rear side are able to classify better compared to the front side in both geometrical and ZM features. In the case of local damages, the rear side is able to classify better in 5 mm–6 mm and front side in 6 mm–7 mm. It is concluded that the features obtained from the ZM gives better accuracy in both global and local damages compared to the geometrical features. The image based analysis carried out on this work is able to classify the impairment in composite materials; this framework can be used in the industrial applications for the quantification of damages. Abstract: Publication date: Available online 17 December 2018Source: Composites Part B: EngineeringAuthor(s): Ariff Farhan Mohd Nor, Mohamed Thariq Hameed Sultan, Mohammad Jawaid, Ahmad Mustafa Rayney Azmi, Ain Umaira Md Shah The addition of carbon nanotubes (CNTs) in natural fibre based hybrid composites as filler to enhanced low velocity impact (LVI) and compression after impact (CAI) properties of composites are not explored by researchers in literature. In this study, we examined the effect of using multi-walled carbon nanotube material (MWCNT) as nanofillers in LVI followed by ultrasonic wave propagation imaging (UWPI) to visualize the impacted damage and CAI properties of bamboo/glass fibre hybrid composites. Hybrid composites containing 0.5% weight fractions of CNTs were compared with the control hybrid composites. The experimental results revealed that adding CNTs into the hybrid composites show less energy absorption, improved peak force, and increased deflection at maximums of 9.21%, 36.23% and 26.06% respectively in terms of LVI properties. Furthermore, smaller damage size was detected by non-destructive approach for CNTs/hybrid composites as compared to the controls. A maximum of 23.67% increment on CAI strength obtained by addition of CNTs into hybrid composites. We concluded that addition of CNTs into bamboo/glass hybrid composites improved impact and after-impact properties. Abstract: Publication date: Available online 16 December 2018Source: Composites Part B: EngineeringAuthor(s): Bishweshwar Babu, B.P. Patel The strain gradient nonlocal theory is important to include the size effects of nanostructures in classical continuum theory with the corresponding development of computationally efficient numerical tool such as finite elements for the analysis of such structures with different boundary conditions. However, there is no literature on the finite element formulation of second-order strain gradient elastic plates. The weak form of the governing equation of motion of the Kirchhoff nanoplate using second-order positive/negative strain gradient nonlocal theories requires C2 continuity of transverse displacement. In this paper, a new computationally efficient nonconforming finite element formulation for the modelling of nanoplates using second-order positive/negative strain gradient nonlocal theories is presented. The performance of the developed finite element is compared with conforming finite element for rectangular isotropic Kirchhoff nanoplates with different boundary conditions. Analytical solution for static bending, free vibration, and buckling under biaxial in-plane compressive loading are also obtained for rectangular all edges simply supported isotropic Kirchhoff nanoplate for the comparison purpose. The nonconforming element is found to be computationally more efficient than the conforming element with better accuracy and convergence rate. The negative strain gradient model predicts results matching with the experimental results available in the literature. Abstract: Publication date: Available online 16 December 2018Source: Composites Part B: EngineeringAuthor(s): R.M. Hizam, Allan C. Manalo, Warna Karunasena, Yu Bai This paper presents the experimental and analytical studies of double-chorded composite truss system connected using stainless steel through-bolts with mechanical inserts. The composite trusses were assembled using rectangular hollow sections of pultruded glass fibre reinforced polymer (GFRP) where adhesively bonded mechanical inserts were introduced at the vicinity of the joining areas. The trusses were tested under 4-point bending (Load Case 1) and 3-point bending (Load Case 2). From this experimental program, the load-vertical deflection behaviour of the truss, internal forces distribution in the members and joint behaviour were investigated. The pultruded GFRP truss under Load Case 1 was capable of resisting the maximum load capacity of the testing equipment at 450 kN with the lowest factor of safety of 1.10 was attained by the external diagonal members. High axial compression forces experienced by the external diagonal members has exceeded the American pre-standard theoretical joint bearing capacity by 2%, and this was reflected by the minor bearing damage observed on the joints of these members. Meanwhile, the truss under Load Case 2 failed at 160 kN with the continuous top chords ruptured in flexural bending manner. The satisfactory comparisons between the Strand 7 truss model and experimental results demonstrated the validity of the adopted simplified numerical model. Additionally, the theoretical strength limits of pultruded GFRP truss members in tension, compression and flexural according to American pre-standard are in close agreement with the experimental results. Abstract: Publication date: Available online 15 December 2018Source: Composites Part B: EngineeringAuthor(s): Sumeet Chakraborty, Tanish Dey, Rajesh Kumar The present paper examined the buckling, postbuckling and vibration characteristics of pre-buckled and post-buckled laminated CNT reinforced composite (CNTRC) cylindrical shell panel made up of single walled carbon nanotubes (SWCNTs) and isotropic matrix. The effective material properties of CNTRC panel are computed using extended rule-of mixture (ROM) method. Higher order shear deformation theory (HSDT) with von Kármán type of nonlinearity is adopted to model the CNTRC cylindrical shell panel. Four different boundary conditions are considered. Besides uniform loading, different types of non-uniform in-plane load distribution such as triangular, trapezoidal, parabolic and partial edge loadings are considered. The internal stress distribution within the shell panel due to applied non-uniform loadings is evaluated by prebuckling analysis. Subsequently, via Hamilton's principle the governing partial differential equations of CNTRC laminated cylindrical shell panel are derived. Employing Galerkin's method and by neglecting the inertia terms the partial differential equations are reduced to a set of non-linear algebraic equation for the static problem. However, for dynamic problem the partial differential equations are converted to a set of ordinary differential equations. Beside parametric study the obtained numerical results from the present semi-analytical study illustrates the effects of CNT volume fraction, CNT dispersion profile, non-uniform load distribution and boundary conditions on the stability and vibration characteristics of CNTRC cylindrical panel. Abstract: Publication date: Available online 14 December 2018Source: Composites Part B: EngineeringAuthor(s): Xu Lu, Lin Zhang, Yang Tong, Z.Y. Cheng Free-standing, flexible, and transparent ceramic-polymer nanocomposite films with a uniform thickness of about 5 μm were fabricated using a simple spin-coating process, in which the polymer solution with a high concentration was used. Ba0.5Sr0.5TiO3 (BST) nanoparticles and P(VDF-CTFE) 91/9 mol.% (VC91) copolymer were used as ceramic filler and polymer matrix, respectively. Microstructures, dielectric properties, and energy-storage performances of the BST-VC91 nanocomposite films have been investigated. With increasing volume fraction of BST, the dielectric constant increases, while the dielectric loss decreases. A dielectric constant of about 38.4 at 100 Hz associated with a dielectric loss of only about 0.02 was obtained in the nanocomposite film with 40 vol% of BST. It is experimentally found that the temperature dependences and the frequency dispersions of dielectric properties were strongly influenced by the volume fraction of BST, especially at high temperatures. Good temperature stability and small frequency dispersion of dielectric constant can be obtained in the BST-VC91 nanocomposite films with 40 vol% and 50 vol% of BST, which are also associated with a low dielectric loss. It is concluded that the motion of the polymer chains is the micro-origin of the relaxation process observed at high temperatures. With increasing volume fraction of BST, the dielectric breakdown strength decreases, while the maximal polarization and remnant polarization increase. The maximal charge-energy density and discharge-energy density of about 21.7 J/cm3 and 7.5 J/cm3 are obtained in the BST-VC91 nanocomposite film with 30 vol% BST under 2500 kV/cm, which are more than 2 times larger than those observed in pure VC91 film under the same electric field. Abstract: Publication date: Available online 14 December 2018Source: Composites Part B: EngineeringAuthor(s): Thomas Berton, Farzin Najafi, Chandra Veer Singh In this paper, a novel multi-scale damage model has been developed to predict the progression of matrix micro-cracking in a prototype car bumper under low-velocity impact. The methodology is based on FE micro-damage modelling to calibrate the parameters of a Synergistic Damage Mechanics model considering multi-axial loading, combined with a matrix micro-crack multiplication model. Python scripting was used to model a series of micro-mechanical FE models to determine the damage parameters, which were then used to simulate damage evolution at the structural scale, using a VUMAT subroutine. Following validation, the effects of the impactor's initial velocity, stacking sequence, rate-dependency and bumper's cross sectional profile have been evaluated for different material systems. The patterns of damage progression show that the damage model can accurately predict the progression of matrix micro-cracking, paving the way for the utilization of accurate multi-scale analysis tools in composite structures. Abstract: Publication date: Available online 13 December 2018Source: Composites Part B: EngineeringAuthor(s): Jing Zhao, Qingshan Wang, Xiaowei Deng, Kwangnam Choe, Rui Zhong, Cijun Shuai In this paper, the free vibrations of functionally graded porous (FGP) rectangular plate with uniform elastic boundary conditions is investigated by means of an improved Fourier series method (IFSM). It is assumed that the distributions of porosity are uniform or non-uniformly along a certain direction and three types of the porosity distribution are considered, among which material property of two non-uniform porous distributions was expressed as the simple cosine. The size of the pore in a rectangular plate is determined by the porosity coefficients. Using the first-order shear deformation theory(FSDT), the energy expression of FGP rectangular plate is created. In order to obtain the admissible function of displacement for functionally graded porous rectangular plate, the IFSM is employed. Then, the Rayleigh-Ritz method is used to solve coefficients in the Fourier series which determine natural frequencies and modal shapes. Convergence and comparative research are performed to prove the convergence, reliability and accuracy of the current method. On this foundation, some new results covering the influence of the geometrical parameters subject to classical and elastic boundary condition are presented, and the parametric studies are also investigated in detail, which can provide a reference for future research by other researchers. Abstract: Publication date: Available online 12 December 2018Source: Composites Part B: EngineeringAuthor(s): Zakaria Razak, Abu Bakar Sulong, Norhamidi Muhamad, Che Hassan Che Haron, Mohd Khairol Fadzly Md Radzi, Nur Farhani Ismail, Dulina Tholibon, Izdihar Tharazi Polymer as well as polymer composites are inclined to premature due to effect on mechanical and physical properties during service time. In this paper, the effect of thermal cycling (−30 to 80 °C) on the physical and tensile properties of Polypropylene (PP), Kenaf/PP, Kenaf/PP/CNTs and Kenaf/CNTs/MAPP/PP hybrid composites for the injection moulded car battery tray was investigated. Although this study had found no physical changes on the samples in terms of colour or cracking, the samples, however, had experienced warpage and dimensional changes. The dimension of samples containing CNT had increased by 20%, while the PP and PP/Kenaf samples had decreased by 3.5% and 87%, respectively. Although the process of thermal cycling was found to have rapidly decreased the hardness of Pure PP and Kenaf/PP composites, it had, however, gradually increased the hardness of composites with CNT fillers. The tensile strength, Young's modulus and elongation of the composites had also been examined in this research. Furthermore, according to the fractographic investigations using scanning electron microscope, it is perceived that the fracture morphology of the samples is strongly influensed by thermal cycling.